Let food be thy medicine…. Diet plays a critical role in achieving optimal wellness as well as preventing a wide range of degenerative diseases and pre-mature aging. We perform testing for food allergies and sensitivities/intolerances so that you can improve your health and wellness and prevent danger reactions and intestinal discomfort. A food allergy triggers an immediate immune system response that can lead to hives, swelling of the face and throat and difficulty breathing, and in severe instances, the immune system response can trigger anaphylaxis, which can be fatal. Once food allergies are identified, those foods should be completely avoided. About 90 percent of all food allergies occur in just a few foods, including peanuts, tree nuts, soy, milk, eggs and shellfish. On the average, 4% adults and 7% children are affected by food allergies. Food sensitivities do not produce an immune system response, and the reactions are typically not fatal. Symptoms are delayed. They are a digestive system response and do not trigger histamine reactions. Symptoms of food sensitivity include upset stomach, pain and bloating in the abdomen, diarrhea, excess gas and acid reflux. It can also cause an inflammation of the stomach and intestines, which can last for days and effect the way your body processes food. If an individual is sensitive to a food, the food should be avoided as much as possible. Many foods can be eaten again after an elimination diet and reintroducing the foods on a rotation basis. Food intolerances affect 80% of the population. Common foods include all the foods listed on the allergen list as well as lactose, tyramine, gluten and various food additives and preservatives, including MSG, sodium benzoate and yellow #5. 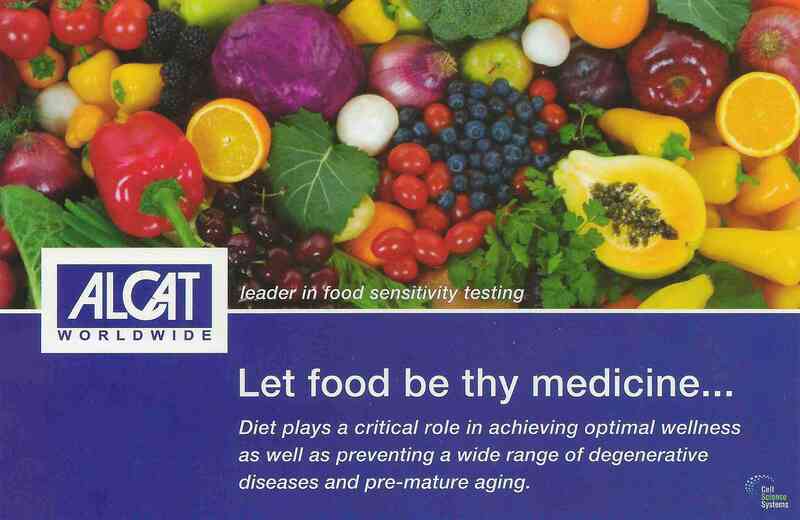 Our testing panels include food additives, chemicals and environmental allergies.. Our 120 item food, additives and colorings panel includes almonds, barley, pepper, cabbage, casein, egg whites, corn, lobster, onions, vanilla, beef, brewers yeast, milk, peanuts and soybeans as well as many other fruits, vegetables, nuts and meats. Our food additive list tests for allergies and sensitivities to aspartame, saccharine, green #3, blue #2, sodium sulfite and red #1 and #40 as well as 13 other food additives and colors. Once a food allergy or sensitivity is identified, that item is removed from your diet for a specific period of time. During the abstaining phase, you will be closely monitored for health and wellness and intestinal and GI tract problems. After the required period of time has elapsed, certain foods will be reintroduced to your diet one at a time. This allows you and our medical professionals to document what happens once the food is reintroduced to your diet. If adverse reactions are noticed, the food will be discontinued, and you will be instructed on the next steps. The reason we reintroduce the foods is to make sure you actually have a sensitivity to the food. Sometimes, when one food is causing an adverse reaction, it can cause other foods to create the same reaction even though you are not actually sensitive to the other foods. This allows us to positively identify the foods you are sensitive to and keep your diet as varied as possible. Benefits Include: Healthy Weight Management Improved Metabolic Function Increased Energy Improvement in Digestion, Respiratory, Skin, and Many Other Conditions…..
To get tested for food allergies and sensitivities, call our office at 817-810-9111 to schedule an appointment.